We, A Great Parade: Should White Families Celebrate Black History Month? 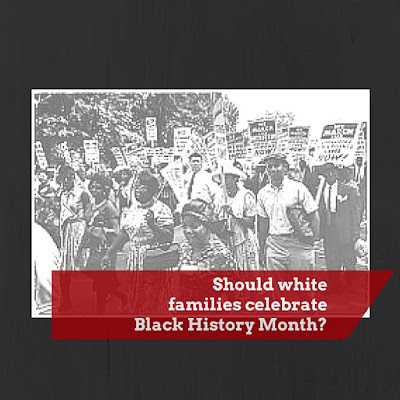 Should White Families Celebrate Black History Month? February is Black History Month, and clearly I'm rollin' in on the late train here but I wanted to say a little something about it. And let's just get this out of the way right up front: yes, I am that white woman who has adopted a black child from Africa and now won't shut up about racial injustices. I'm such a cliche. Now that we've said hi to the elephant in the room, how 'bout that question up top? 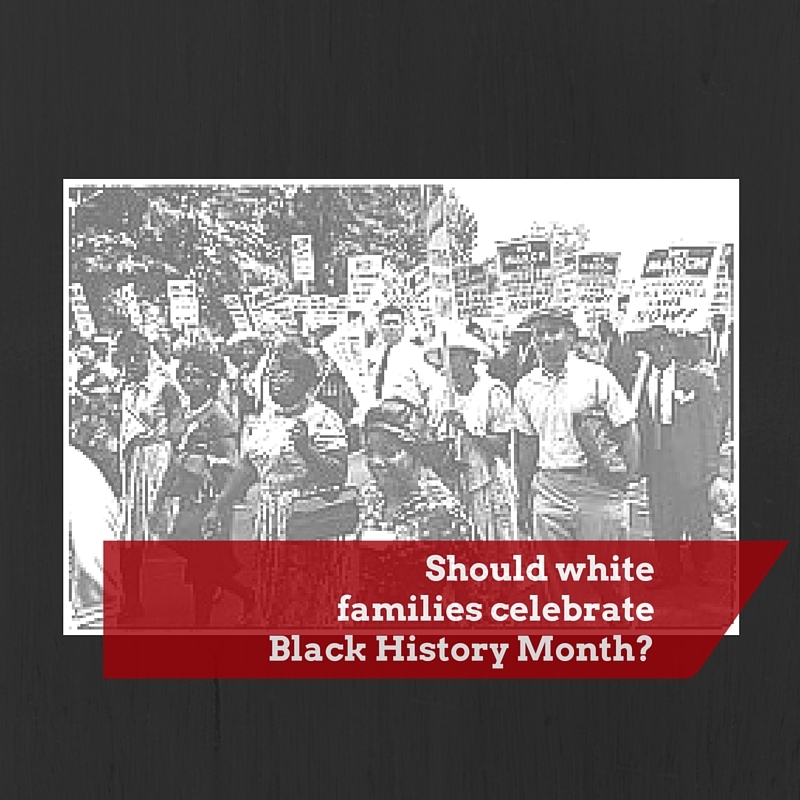 The answer is yes, white families should celebrate Black History Month. Will doing so look the same for Caucasians as it might for African Americans? Maybe not. It doesn't have to look any particular way at all; what's important is that there actually is an intentional time that we as a society review the ugly, painful parts of our history and also (don't leave this part out!) seek to understand both how it continues to affect our present, and how to move forward together towards restoration. Why take the time and effort to incorporate this into your February home life? You can ensure that you know exactly what your child is learning on the subject. Simply assuming that their school is covering it is really not enough: on one hand, it may not actually even be covered at all and on the other, it may not be done well or thoroughly. And if you are white and you homeschool, it could be easy to accidentally miss completely without an extra dose of intentionality. One gaping hole in educational curriculum is that it tends to abruptly end in the 1960s, as though slavery and segregation had no long term effects on our country. As parents, it's our job to fill in the blanks. Children are more likely to believe that a topic is important if they see that it's important to you. Many parents try to raise "colorblind" kids by simply avoiding the topic of race altogether. This has proven ineffective. Children are human beings: they see differences just like the rest of us, and they need guidance in how to process those differences. If equality is a value to you, your child needs to hear you talk about it just like they need to hear you talk about faith and morality. It opens a discussion on race and invites the child to share any concerns or confusion they may have. Your kids are intuitive; they can tell when a subject is taboo and they'll often keep their questions to themselves to avoid a social faux pas. They need a safe space to ask their questions without fear of judgment or ridicule. It forces you to do the uncomfortable work of asking your own questions about the state of racial equality today. In the past year, this issue has been increasingly brought to the forefront of our national attention. However it is far too easy to quickly slap down an opinion sticker and give it no further thought. It is healthy and necessary for all of us to continuously ask questions about how our collective past is affecting our present, and what we as individuals can do about it. That same author has a recommended book list, mostly picture books with some more advanced ones as well. Here's a more thorough book list for older children. And Pinterest is full of other book lists as well. This one from my Children's Books board is a compilation of books specifically about slavery. If you don't know where to start, look no further than the good ol' internet and your local library. And remember, it's not about doing it perfectly or having the answer to every question. It's about creating a safe space for open dialogue to hopefully produce a greater sense of justice and empathy in our children.